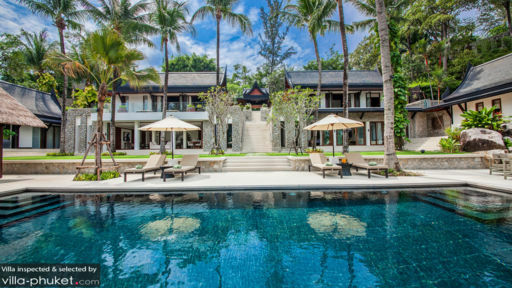 A sprawling estate located near Kamala beach in Laem Son, Phuket, Villa Analaya is beautiful property rich with tropical foliage overlooking the ocean and accessible from a beach. The villa itself is a luxurious property with six bedrooms, living and dining space including alfresco dining, as well as recreational facilities. With quality amenities and five-star services, the villa aims to provide the best of experiences to its guests in everything they do. There are several places of interest around the villa including beaches and Thai restaurants that are a must-visit! There are six, well-furnished and air-conditioned bedrooms at Villa Analaya that are similarly designed with wooden interiors and traditional Thai accents to bring out the opulence. The bedrooms are meant for 10 people, and in case you wish to book for more, you could always make requests however, at an additional cost. The bedrooms are furnished with king-sized beds and double beds, also featuring large glass windows overlooking wondrous nature outdoors. There are sofas and armchairs in the bedroom for additional seating and for your ease. Five of the bedroom have an en-suite bathroom with freestanding bathtubs and/or shower areas, while the sixth shares with another. A 25-metre infinity swimming pool highlights the garden area at Villa Analaya with dark-stone surface and bordering vegetation. Colourful flowers blooming and releasing their sweet scent into the air adds a bit of meditative charm to the area, not to mention the luscious green grass and the verdant gardens. For lounging purposes, the pool deck is graced by several sun beds with parasols to shade you from direct sunlight. A traditional sala beside the sandy shores is just the alfresco dining space you’ve always been dreaming of as it a luxurious and enchanting experience. Not just indoors, but there is seating out in the open at Villa Analaya to provide ample space for guests to make the most of their naturally abundant surroundings. The main opulent living area is marked by deep, wooden interiors that are nothing short of absolute luxury and pure elegance with bold colours and a traditional Thai ceiling to complete the look. Comfortable sofas and armchairs face the verdure of the gardens, and there is a flat-screen TV as well in case you wish to watch films or shows. The dining area is housed just behind the living area and features a 12-seater dining table and makes for a formal dining room for guests where they can immerse themselves in many a culinary adventure. The room is decorated with a significant Buddha bust and sports a traditional Thai ceiling for a luxe vibe that continues on from the living area. For recreational purposes, the villa also houses a multi-purpose gym for your fitness needs. The excellent and jovial staff at Villa Analaya will make your stay all the more fantastic with their hospitality and expertise. With chores taken care of, the staff will ensure that you have everything you need right from the moment you check in. They are happy to add recommendations to your itinerary and also help with car or boat rentals. For meal preparations, massages, laundry, you can discuss with staff and they can make necessary arrangements! 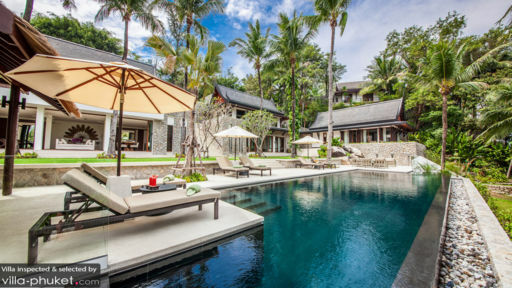 The villa couldn’t be more ideally located as it is right at the tip of Laemson and close to both the famous Kamala beach and Laem Singh beach, home to thriving marine life; You can even feed them if you wish! There are several restaurants in the area including Silk, great for local Thai delights and for drinks head to HQ Lounge! The place was very beautiful and the staff were so friendly and helpful. The night view is awesome and close to the beach. We all relaxed and felt so rested while we were there. I would highly recommend to anyone.